To educate and inspire character and equality through the virtue and valor of our World War II American veterans of Japanese ancestry. The Nisei experience during World War II was complicated to say the least. At the outbreak of the war, many Japanese American families were forced from their homes and had to uproot their lives due to a perceived threat to the United States’ public safety. To say that this was a difficult time for Japanese American families and the Nisei would be an understatement. For one, Nisei children had parents who grew in Japan and still had relatives living there, keeping familial and cultural bonds to Japan very much alive. In some cases of the interviewed Nisei soldiers, they returned to Japan as children to study and attend school, often living in the country for several years. Other Nisei children grew up in America, never visiting Japan, and had relatively little connection with the Japanese culture other than through their parents or community. What was common to these interviewed Nisei soldiers was that they all identified themselves as Americans. Sadly, these Japanese Americans were forced to leave their homes and, despite their allegiance, were forced into internment camps all in the name of public safety. As the war broke out, many Nisei honorably joined the military, wanting to serve their country and escape a prisoner’s life in the camps. 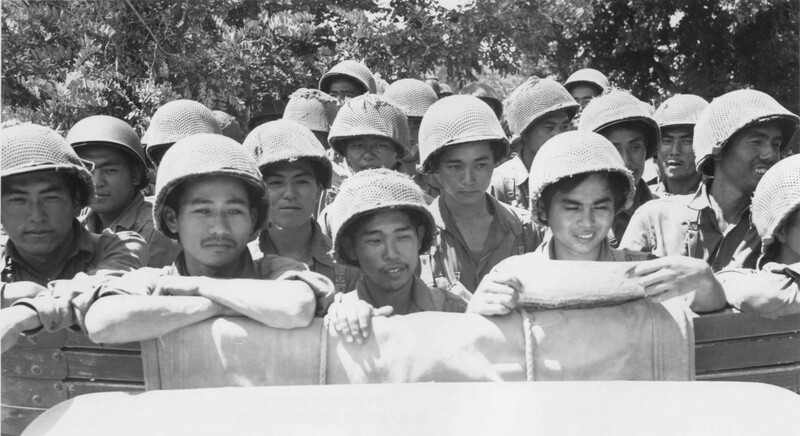 Often times Nisei soldiers were conflicted morally, wanting to serve their country, but also angered and saddened by the human rights violations that their families were going through at the hands of the United States government. In addition to this, parts of the county were ripe with anti-Japanese sentiments and prejudices, including against Nisei G.I.s. Imagine taking on the honorable deed of military service, only to be criticized and insulted by a portion of the general public. A very tough situation it must have been indeed. Nisei veteran, Ted Tsukiyama’s quote highlights the struggle that the Nisei soldiers faced. On one hand, Japanese American soldiers were serving on a hostile war front where survival and returning home was not guaranteed. On the other hand, those soldiers that served domestically or were returning home from battle, faced a home country where discrimination and prejudice against minorities – even upstanding, good citizens – was common. In my opinion, much of the Nisei’s resolve to carry on in the face of conflict came from their own parents teachings and advice. In many of these interviews, the interviewees often speak of hard-working parents who did not complain about their misfortune, but instead focused on bettering themselves. The Nisei often adopted the mantra of “shigata ga nai” (cannot be helped), focusing on the things they could control. While eventually feelings of hostility towards the Nisei dissipated, the treatment of the Japanese American community during the war leaves a black mark on our country’s history. Utmost respect is deserved for the Nisei soldiers who had the resolve and courage to get through this difficult period. These Nisei veterans are true American heroes. Life is short. Too much of life is spent in hatred and unnecessary conflict. People squabble with one another. Nations go to war against their enemy. Anger and violence fill the short years that should instead be spent caring productively for families, neighbors, and society. Often, both nations and people lack second chances and the opportunities to learn from their mistakes. Without envisioning the results of their actions, they make decisions based on fear, anger, ignorance, apprehension, or uncertainty. Their quick actions result in permanent or long-lasting consequences, of which they cannot take back. Sometimes people die, liberties are lost, or prejudice and injustice ferment. How often these nations or people wish that they could simply turn back the clock, and – now armed with the knowledge that they have about the destructive consequences of their actions – take a different path. They would not repeat the same mistakes. The death, lost freedoms, and injustices would never occur. A truly just and equitable society would be able to flower. That is why history is so important. Both people and countries can look to the lessons of the past in order to learn from the consequences of what others did. They can judge, in hindsight, all of the positive and negative effects that occurred when their predecessors took certain actions that they are themselves considering in the present. They can look to avoid taking actions that resulted in consequences of deaths, lost liberties, and injustices in past history. They can look to follow actions that resulted in positive results and expanded freedoms. History is like one giant instruction manual for the current generation to follow. No one can claim ignorance when they have the annals of history as their guide. And that is why we do what we do. By preserving the history of the Japanese American World War II experience, we are providing lessons to current and future generations. Our government can learn from its mistaken treatment of Japanese Americans during wartime. Our citizens can learn of the courage exhibited by the young Japanese American soldiers and their families. And we all can learn about the beauty – and the strength – that can occur in human society even during the worst of times. THAT is why we do what we do. Each video that we preserve, each letter that we document, each photograph that we share – every single one of them contains lessons for current and future Americans. Our archives is but one large instruction manual for the betterment of human society. He vividly remembers Schofield Barracks being a “tent city,” and how the tent city was sprayed with bullets by enemy fighters. Luckily, since it was a Sunday, the tent city was, for the most part, empty. In reaction, he was told to “wait for what was to come” with the arms they received earlier. They were now armed and prepared, just waiting for the enemy. They had accidentally shot down one of their own planes that happened to fly overhead as it made its way back to an aircraft carrier. For those not involved in the project, it may indeed seem like an odd waste of time. But we do it so that stories are not lost, history is not forgotten, and important lessons from the past do not vanish as one generation gives way to another. We do it so that the actual voices of those who witnessed history are preserved for posterity. In the late 1930s, the US Government recorded the oral histories of the last surviving African American slaves. With this important effort, students in 2015 and beyond can listen to the voices of the actual men and women who were unjustly enslaved in the 1860s. It gives me chills just thinking about this. It was the efforts of a small team of government historians and archivists who made this possible, and because of them, this first-hand history will always be available to students, scholars, and the general public. THAT is why we do it. It is sad to think of it, but pretty soon all of the Nisei soldiers of World War II will be gone. But because of our organization’s efforts, they will always live on. In our oral history videos, they will always speak directly to future generations about the struggles that they overcame and the courage that they showed. Their history, which is our history, will forever be preserved and celebrated.